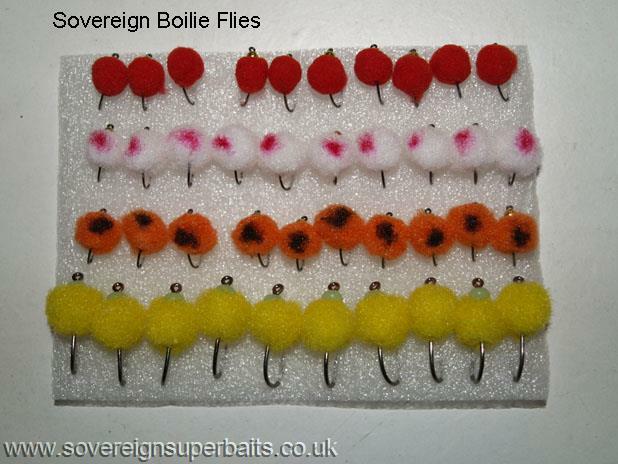 : We have added a few new patterns to the carp fly range, here we have some "Boilie" flies. They are all listed as 10mm by the tiers, but the Red ones are closer to 8mm. 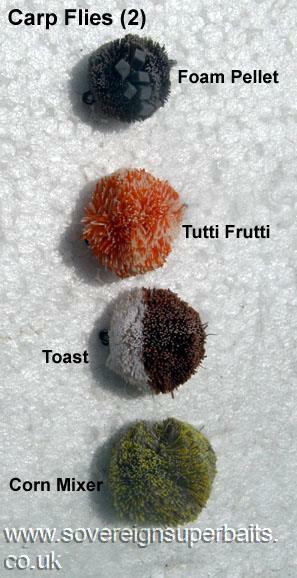 The White & Orange ones are a generous 10mm & the Yellow ones are more like 12-13mm. to the eye to make it sit just head down on the surface & hook up if you are going to anchor them to the bottom. The Yellow ones are on a size 4 long shank, heavier hook, with a lumo bead in front. These will sit just hook down on the surface & fairly flat when anchored to the bottom. Mark Colvin with a double-figure Carp caught on a Pellet Fly. : In picture (1) we have three more flies which are available singly or in mixed packs. A crust fly made from two colours of deer hair, a general dog biscuit, also made from two colours of deer hair, and especially for those of you who have complained you cannot spot your pellet fly among the Chum Mixer groundbait we have put an orange spot on the upside of the fly, making it easier to see. All our 15mm flies are mounted on Kamersan Size 8 barbless carp hooks. Our 10mm flies are mounted on size 12 barbed Mustad Carp hooks. : These flies were originally designed for us by Pete Finnis for catching Carp. They obviously imitate a floating pellet or Pedigree Chum mixer. Our biggest fish to date on these flies is a mere 18lb. Can you do better? 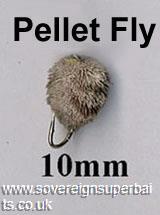 In Picture (2) we have four more pellet / boillie flies. The foam pellet fly is available singly and the two boillie flies and the Toast are available singly or in a mixed pack, all tied by the same people on the same hooks for us (please note these flies are only available in 15mm at the moment. 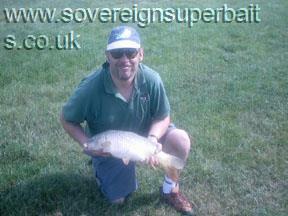 Our resident fly designer, Peter, with a Carp on one of his 10mm pellet flies.